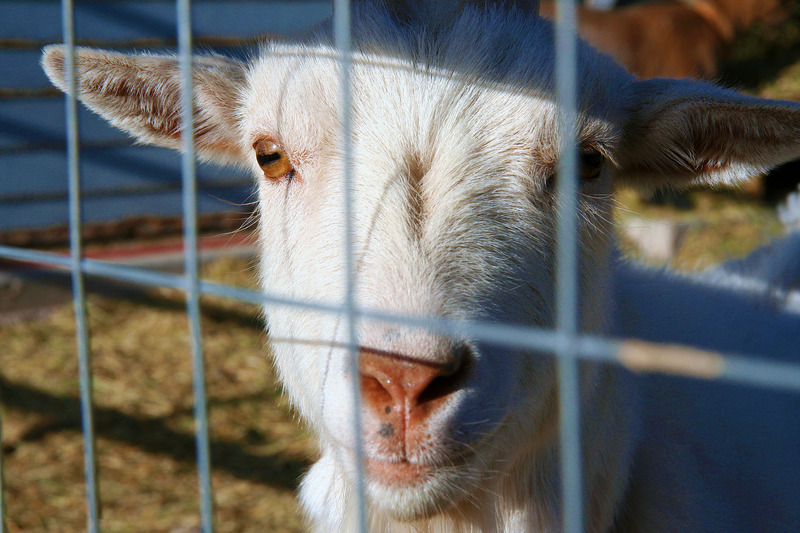 I’ve often wondered why goats have horizontal slit-shaped pupils. In the little bit of information I’ve been able to find on the subject, animals like goats may have evolved horizontal pupils because better vision in the vertical plane may be beneficial in mountainous environments. Apparently, having horizontal slit-shaped pupils increases their peripheral depth perception and also makes it easier for them to see at night. Did you know that donkeys have blind spots directly in front of and behind them and that they can’t see the ground when their heads are raised? I had goats for years and actually never thought about their horizontal pupils, except I thought they were kind of cool, but that’s very interesting. I do know they were the best ‘watch dogs’ on my farm, letting me know when anyone approached, even before my dogs. I never knew that about donkeys … wow! So a goat would be much less apt to walk over a cliff than a donkey? This is a pretty looking goat. Thanks for the information, I didn’t know about the goats and neither about the donkeys. Do the blind spots make it more difficult for them to spot a whole in the ground for example? That’s a good question! I don’t know the answer, but perhaps that’s one of the reasons why donkeys can be so “accident prone” if there are things left around for them to hurt themselves with. I’m such a nerd! I love knowing things like what you posted today. Partly because I was a life science person in college. The “Why” is something that grabs my attention every time. You are just a well of information today! Thanks for the knowledge. It will interesting to see when I can use it… Maybe I should start up a game of trivia and somehow manage to have this as one of the questions…yep, I’m thinking of loading the deck – haha..Happy Easter to you guys. Meggie is a cutie pie. I also didn’t know that about goat and donkey vision. Fascinating! I’m with CeeCee – I always want to know “Why” 🙂 Thanks for the info! I wonder what the world looks like if they tilt their head. Does it matter if you have a line for a pupil? Horses also have that blind spot, right? I’m not sure about horses… all very good questions! That’s pretty fascinating! I had no idea about goats eyes. Interesting….